Dr. Martin Luther King Jr. popularized the phrase “beloved community” to represent his vision for societies that embrace cooperation, unity, and connection. To honor and apply this bold idea, Salt Lake Community College’s School of Arts, Communication and Media received a grant in 2015 for a new pilot program to encourage photography by local students that showcases their own cherished neighborhoods. During the Fall 2015 semester, 6th grade students at a local Utah elementary school (Whittier Elementary in Salt Lake City, UT) were given access to cameras and received instruction on how to use them by Salt Lake Community College (SLCC) photography faculty and students. After participating in classroom activities that explored Dr. King’s legacy, led by a faculty member from the SLCC English department, the students took photos that highlighted their own beloved connections with their communities, which will be displayed in a public gallery exhibit at the SLCC South City Campus in February 2016. This will highlight a unique attempt to connect higher education arts departments with K-12 students in order to expand local arts engagement, facilitate expanded educational opportunities, and support distinctive relationships between two-year colleges and surrounding communities. By working with a school where minority students make up 56.1% of the student body and 80.7% qualify for free or reduced lunch (source: http://public-schools.startclass.com/l/92869/Whittier-School), this program provides traditionally underserved populations with exceptional access to equipment, training, and face-to-face interaction with college educators. This presentation would include insight by participating SLCC faculty members Whitney Hyans (photography) and Elisa Stone (English), who would discuss the program’s pedagogy and examine the educational outcomes of combining technological and cultural lesson plans into a positive, interactive educational opportunity. As the School of Arts, Communication and Media prepares to expand the Beloved Community project to more schools and students during the 2016-17 school year, this presentation would also encourage conference attendees to explore and pursue similar collaborative efforts that connect their institutions with diverse student populations. Salt Lake Community College is an accredited, student-focused college meeting the diverse needs of the Salt Lake community. Home to more than 60,000 students each year, the College is Utah's leading provider of workforce development programs. SLCC is also the largest supplier of transfer students to Utah's four-year institutions and a perennial Top 10 college nationally for total associate degrees awarded. In 2012, Stephen Jones, then Dean of the School of Fine Arts and Communication at Brigham Young University, convened a meeting of fine arts deans from around the state of Utah to discuss and work together on a legislative-funded K-6 arts education initiative. 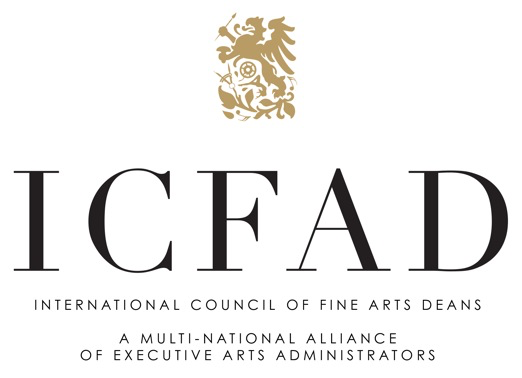 Following this initial meeting, the same group began to meet several times each year, developed bylaws, and decided to call the organization the Utah Council of Arts Deans (UCAD). Although collaboration on K-12 arts education initiatives is still a focus of the group, the mission is much broader and consists of deans helping deans to positively impact the development and ongoing effectiveness of the arts in higher education in order to meet the needs of the State of Utah for high quality arts and arts education programs both today and in the future. To this end, agenda items thus far have included the potential for sharing visiting artists, collaboration on international programs, sharing data on space allocation and building projects, and sharing ideas on accreditation, faculty loads, and diversified funding streams. In Spring 2015, the College of Performing and Visual Arts (PVA) at University of Northern Colorado launched an Arts Entrepreneurship initiative designed to prepare students for success in the highly competitive and ever-evolving world of the professional performing and visual arts. The program was developed with the support from the Provost’s initiative “Innovation @UNC,” and it consists of curricular and co-curricular activities that allow students to develop entrepreneurial skills through real-life arts experiences. The curricular part, an arts entrepreneurship certificate, combines coursework from PVA and the Monfort College of Business. The co-curricular aspect offers opportunities such as a performing and visual arts competition with the winners presenting at a regionally recognized arts venue, a multidisciplinary “salon,” and community-based arts projects. These co-curricular activities are exciting, innovative, and often engage the community around UNC. This session examines the types of co-curricular activities PVA has developed, the ways in which these opportunities build entrepreneurial skills, and strategies for designing interdisciplinary experiences facilitate community engagement. If we were to believe all the rhetoric around massive open online courses (MOOCs) just a few years ago, we were witnessing the revolution in higher education. David Brooks of the New York Times described the arrival of MOOCs as a “tsunami” (2012). Though much of the excitement has died down, the number of MOOCs continues to grow, as does the debate about their purpose and their effect. Notably absent from this discussion is the voice of the arts in the academy. This presentation will include discussion about the decisions of fine arts faculty as to whether or not to engage with massive open online courses (MOOCs). It examines the personal, pedagogical and political factors that influence their thinking about MOOCs. These include faculty opinions on technology in the culture, higher education, and in their own lives; the issue of time in their lives for this new work; their conceptions of arts learning and of MOOCs; and the institutional motivations that affect their choices. This study comes at a critical time, as the rapid growth and dramatic presence of MOOCs have sparked much discussion about their place in academia. They have also given rise to conversations about pedagogy, student access to education, and the role of technology in teaching and learning. Faculty who teach the fine arts – a group that already has a tradition of being marginalized within the academy – have been absent from these discussions. It is important to identify why this might be the case, since this absence may have major implications for the future of the fine arts. Through semi-structured interviews with 16 faculty members from four colleges and universities, this study investigates how fine arts faculty are making meaning of their place in this new pedagogical landscape and what their choices might mean for the future of their discipline. This work has the potential to provide insight into the impact of major changes in higher education on other faculties who also wrestle with the perceptions and realities of marginalization. There is no such thing as unlimited funding and managing expectations with available resources can be a challenge. But with good planning and creative design solutions, projects of excellence can result at any budget. This discussion focuses on how to maximize each dollar spent to create the greatest value for your institution. We will explore topics such as establishing priorities and guiding principles, planning for future phases, developing total project cost models that reflect financial reality, using standard materials in innovative ways, designing dual purpose spaces, developing partnerships, effective fundraising, and more. In this session we share best practices for getting the most out of every dollar spent. The musical Parade dramatizes the trial and lynching of Leo Frank who, on sketchy evidence, was convicted of killing thirteen year-old Mary Phagan. In 1915, after Governor Slaton commuted Frank’s sentence, an angry mob from Marietta snatched him out of prison, taking justice into its own hands. In 2015, Kennesaw State University commemorated the centennial of Frank’s death by performing this Tony Award-winning musical at the Strand theatre, less than a mile from where Frank died. The company also performed at the Temple in Atlanta, Frank’s home congregation. Hear about the healing conversations this production inspired in a community where a one-hundred-year-old tragedy remains a hot topic. Contemplating a building construction project can be simultaneously exhilarating and daunting. How does such a process begin? And what strategies can contribute to a successful end product? This presentation will include discussion about the challenges, opportunities, costs and rewards of such projects in a brief, “nuts and bolts” outline of the process, with ample time for participants’ questions and conversation. Drawing upon my experiences as a practicing musician and as an academic leader at the University of New Mexico, California Institute of the Arts and Cornish College of the Arts, I will explore how the knowledge economy is being transformed into an economy increasingly dependent on original ideas. Artists, who are incredibly adept at creating knowledge through well-developed use of imagination and creative practice, have had and will continue to have an important leadership role as original thinkers in the 21st century society and beyond. Referencing themes in such works as Originals: How Non-Conformists Move the World by Adam Grant and Creativity, Inc. by Ed Catmull, I will provide examples about the power of originality to move the world forward and the exciting opportunities ahead for artists to be in the forefront of this transformation. Many institutions are finding that their performing arts programs are outgrowing their current facilities, and that these facilities are no longer attracting top students and faculty. Step one in planning a performing arts facilities expansion or renovation is understanding the program and space needs. An evaluation of performing arts programs, their activities, and their use of space can lead to a clear assessment of the role of existing spaces and new spaces that may be needed. Join in a round-table discussion with an acoustical consultant and theatre consultant who will facilitate a conversation about the unique space needs of performing arts education, rehearsal, and performance, and how to assess your institution’s facilities and needs. This discussion will share experiences and lessons from recent multi-departmental projects which have benefitted from this approach. At Rider University’s School of Fine & Performing Arts we have instituted a large number of initiatives to build and strengthen a sense of community. The result has been significant growth in retention, as well as a reputation for being a place where students feel supported by their community of peers and faculty. This session will share some of those initiatives and then invite participants to share their own success stories. Whitecliffe College of Arts and Design is leading the way with sustainable and ethical design education in the BFA programme, and this year launched New Zealand’s first MFA Fashion and Sustainability programme, offering postgraduate opportunities for fashion designers with an interest in sustainable and ethical fashion practices. Within the undergraduate programme there are offerings in sustainability and opportunities to create a community of care. In the Fashion Design programme all students are encouraged to consider issues of sustainability, including environmental and social concerns within, both the global fashion industry and specifically their own fashion practice. More and more students employ natural dyes, artisan craft techniques, organic fabrics, recycled materials, dead stock fabrics, and minimal or zero waste to create innovative and sustainable results. This discussion will highlight some of the innovative projects students at Whitecliffe have undertaken, including responses to their carbon footprint, collecting and separating all their fabric waste, for shredding and recycling, upcycling men’s suits and creating contemporary daywear for a fund raising event to support a child cancer charity, as well as creating graduation collections that represent a safe, ecological supply chain, and ethical, fair and moral conditions of all the workers in the supply chain. The Fellowship Program with the American Council on Education has served more than 1,800 vice presidents, deans, department chairs, faculty and other emerging leaders since 1965. Condensing years of on-the-job training and skills development into a single year, the experience is truly transformational, as Fellows are able to shadow senior leadership at another institution. Additionally, ACE Fellows attend leadership seminars, engage in team-based case studies, visit campus leaders at other institutions both nationally and internationally, facilitate special projects, and attend national conferences and workshops. In the spirit of deans helping deans, two former fellows will discuss the application processes, the fellowship year, and ways in which the network and knowledge of ACE fellows can be useful to deans and their colleagues. Fine and performing arts programs at colleges and universities have tremendous potential to impact their surrounding communities. At The University of Alabama, community outreach via the arts is extensive, involving faculty and students in art, creative writing, dance, music, and theatre. This presentation focuses on arts outreach programs at The University of Alabama as examples of how programs such as these can impact communities while also providing valuable learning opportunities for the undergraduate and graduate students involved in them. Programs include a creative writing club for high school students; an African-American art education program for K-12 students; a community music school with participants ranging from 3 months to 92 years in age; a network of fundraisers for which students have produced art and raised thousands of dollars for charities; on- and off-campus galleries and performances that have contributed to downtown revitalization efforts; and more. At any gathering where deans will have the opportunity to voice the needs of their units you will likely find few, even those with the largest budgets or endowments, who believe they have all the resources needed to operate at their true potential. Having the ability to see potential, within what may appear to others as only ordinary circumstances, or vision, is often regarded as a fundamental administrative skill. Vision, along with having the initiative, perseverance, and determination to progress one’s unit beyond its current status, is important for progress. But, vision and the best of intentions may be of little meaning if these have no way of being projected beyond the dean’s purview. What about those elements beyond the dean’s purview that are absolutely essential for vision to be realized, especially financial resources? How does one move from merely having a vision toward aligning the resources necessary to bring vision to fruition? How does one develop relationships with major donors and cause them also to visualize and embrace the opportunities? What media are most effective at creating imagery in the minds of administration and donors, and what are the best practices from development in terms of presentation of these media? While such media can take various forms— from print to video, to campus events— or even something as simple as personal visits with donors, this ICFAD presentation will focus on the medium of a print booklet created and produced by the dean of the College of Fine Arts (CFA), in collaboration with the Office of University Advancement, at Stephen F. Austin State University (SFA). This booklet, the Transformative 2020 Vision, is intended to transfer the vision from the CFA into the imaginations of administration and donors to the extent that they desire to invest resources willingly toward making a vision become reality. A.C. “Buddy” Himes, dean of the College of Fine Arts, along with Dr. Trey Turner, Executive Director of Development at SFA, will discuss all of the concepts presented herein and make copies of the booklet available to ICFAD participants.